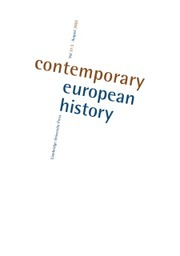 Contemporary European History covers the history of Eastern and Western Europe, including the United Kingdom, from 1918 to the present. By combining a wide geographical compass with a relatively short time span, the journal achieves both range and depth in its coverage. It is open to all forms of historical inquiry - including cultural, economic, international, political and social approaches - and welcomes comparative and transnational analysis. One issue per year explores a broad theme under the guidance of a guest editor. The journal regularly features contributions from scholars outside the Anglophone community and acts as a channel of communication between European historians throughout the continent and beyond it.